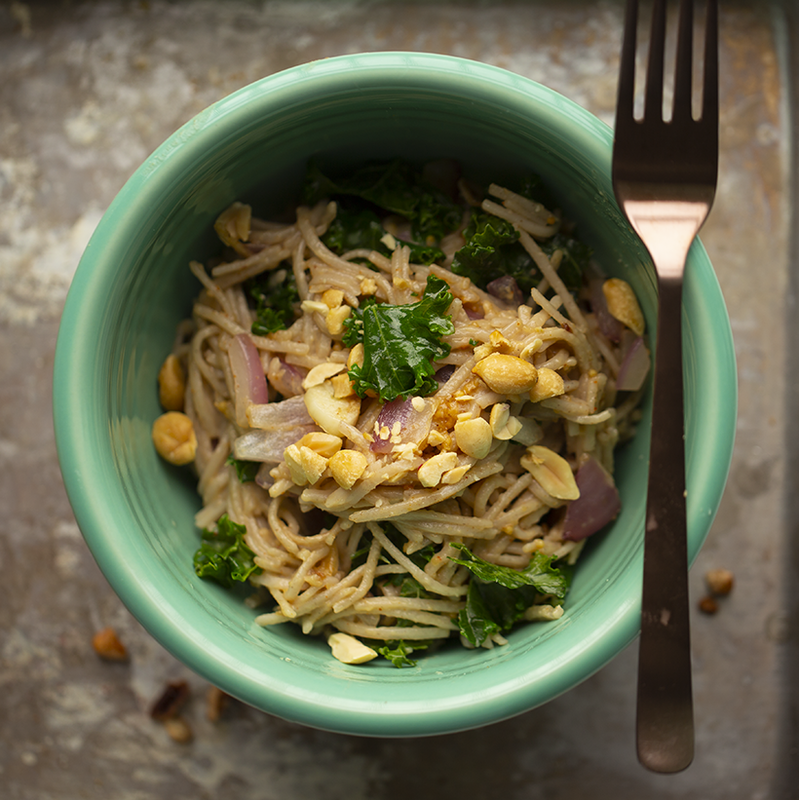 These Easiest Yummy Peanut Noodles are a quick version of the beloved "peanut noodle." They have just enough complexity to the flavor to keep things interesting, yet they are quite simple with prep and ingredients. Perfect for a lazy summer afternoon or as a busy workday meal. These make great 'make ahead' noodles because they taste delicious both warm or chilled. Soba noodles are so great. They cook in a flash and contain healthy buckwheat. More on Soba. Some soba noodles are a blend of wheat and buckwheat and other varieties (that are usually harder to find and more expensive) contain 100% buckwheat. Soba noodles can be tossed with a wide variety of dressing or flavors. 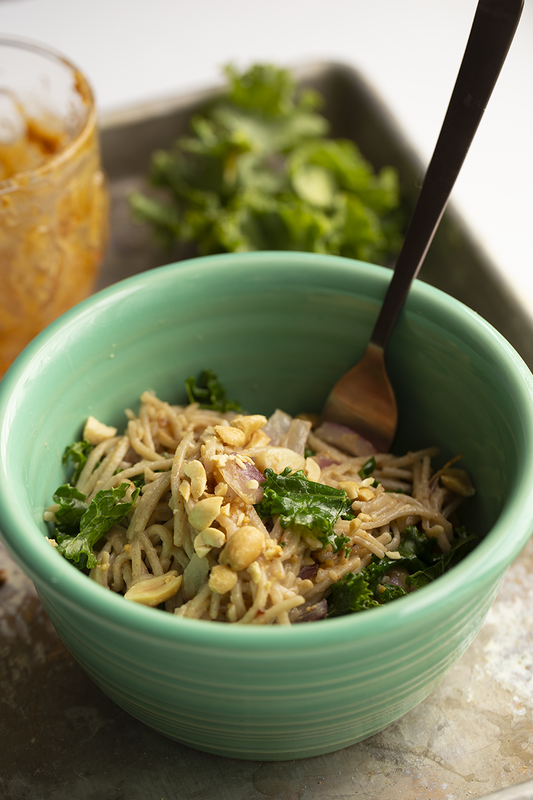 My faves include anything with garlic, ginger, spice and of course peanut sauce. 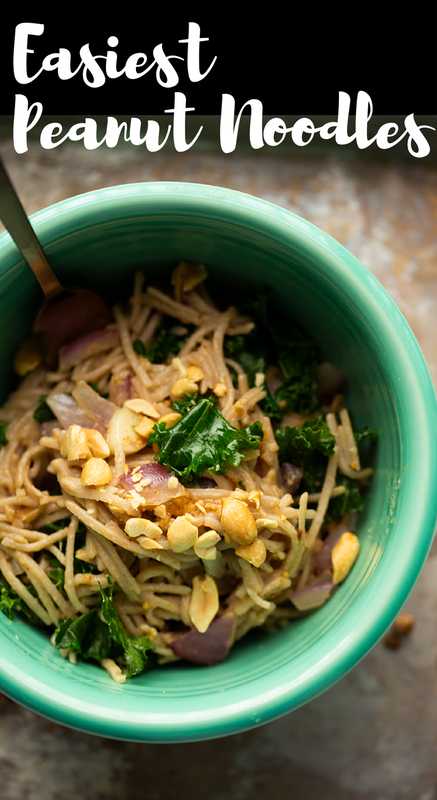 If you want to take the long route with a peanut noodle bowl, you can make my perfect peanut sauce separately and then toss everything together in a low heat skillet - onions, garlic, sauce noodles. But for today, I really wanted a super speedy recipe, so this recipe did it. Noodles. Some veg. Peanut butter. Meal Success. Boom. 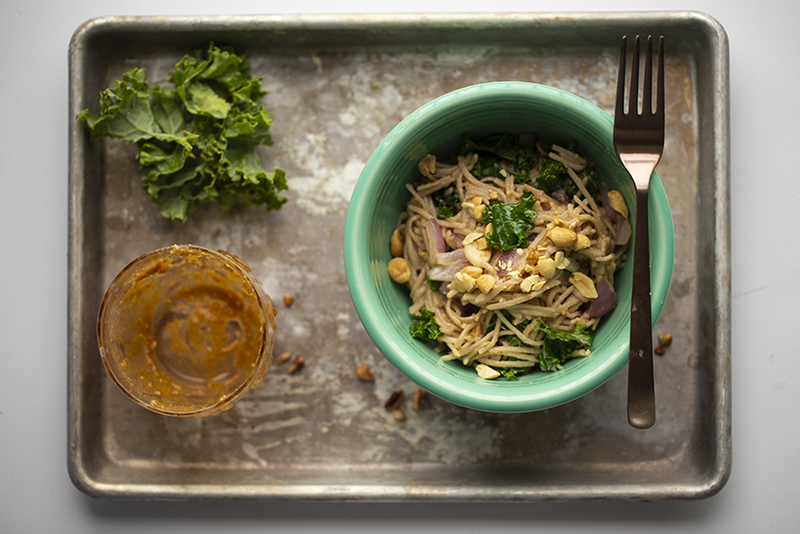 And if you are just REALLY feeling peanut butter, you can top with my Peanut Butter Tofu. This recipe makes a delicious lunch main or dinner side paired with more veggies or a salad. You can also add some protein-rich sides or toppings like skillet tofu, beans, tempeh bacon, your fave veggie sausage or just, as always, more veggies. 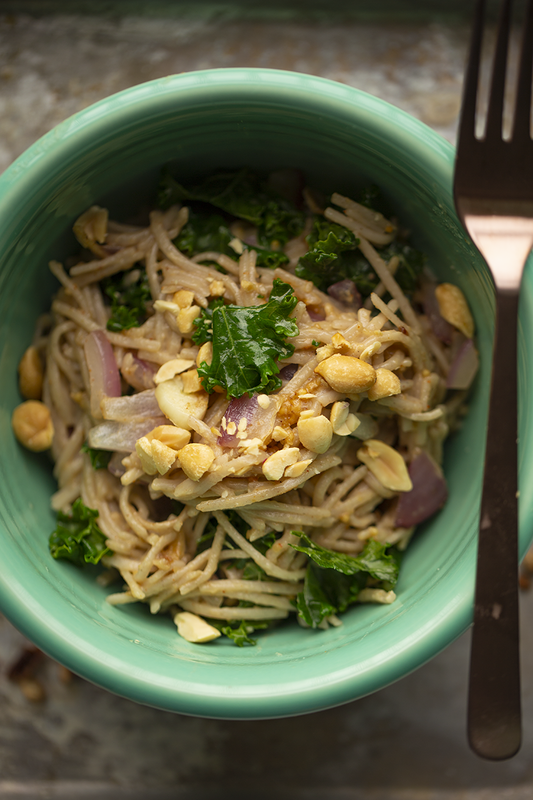 These super easy peanut noodles are creamy and nutty with an accent of heat and sweet and kale. Whip them up in minutes! Bring a large pot of water to a boil. Drop the soba noodles. Cook until tender, usually just 3-5 minutes. Verify time with package directions. Drain noodles and set aside in a medium bowl. In a small glass, stir together the maple syrup, tamari and peanut butter. Set aside. Warm a large skillet over high heat. Add the olive oil, onion and garlic. Saute for about two minutes, or until onion is tender. 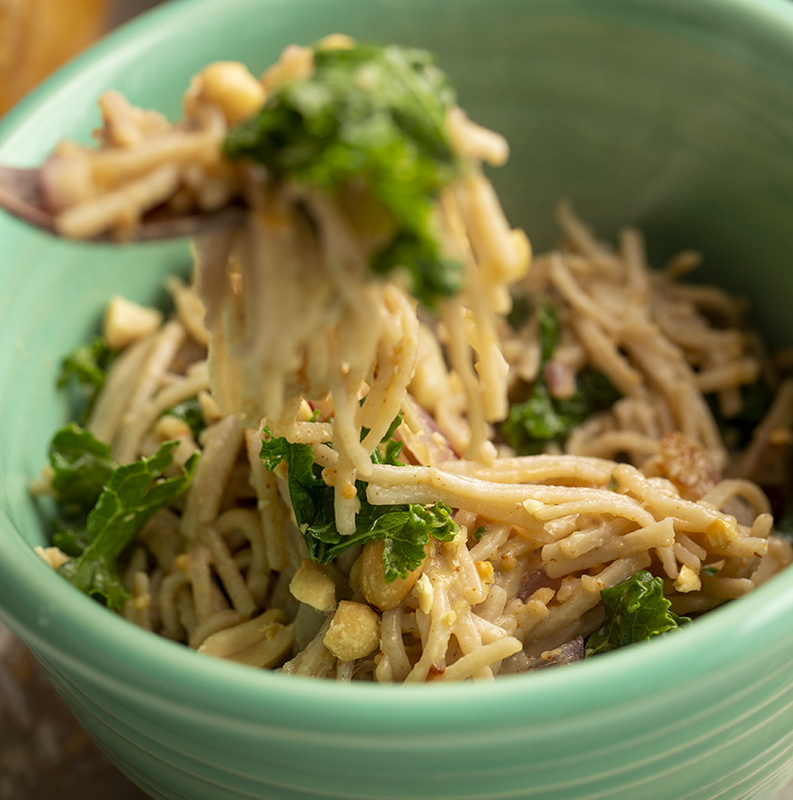 Add the peanut mixture to the noodles and gently toss to coat noodles. It is ok if it is slightly clumpy. Turn skillet heat to low. Add the peanut-coated noodles to the hot pan and toss with the onions and garlic. Fold in the kale to wilt. Do a taste test and add optional cayenne and salt or tamari to taste. Serve warm or chill in the fridge for later.